I now have a test Win 7 virtual machine on which I’ve installed the “convenience rollup update”, KB3125574. Rather than start with a clean setup I chose a Win 7 system that was up to date as of January 14, had been set to do manual updates only, and was configured for maximum privacy (e.g., settings were tweaked, telemetry jobs were disabled, etc.). The system also had several updates hidden. These are the Windows Updates I had hidden on that system before installing the “convenience rollup update”. They include GWX and telemetry, as well as the Windows Genuine Advantage update from years ago. I have some uncommon software that allows me to see what communications are being attempted, and I can verify that this particular setup was completely quiet before the update. The idea here is to see whether installing the “convenience rollup update” could be useful with an existing system that’s both up-to-date or mostly so, and which had experienced some Windows Update slowness before. Today I installed the “convenience rollup update” from the catalog .msu file downloaded from Microsoft. I’m monitoring the communications carefully. Afterward, so far, I haven’t heard an new peeps out of the telemetry software. I checked the various scheduled jobs and whatnot. Pro-privacy configuration changes I had made were left in place, and disabled jobs were left disabled – which surprised me a bit given Microsoft’s recent moves. Maybe the folks who are doing Windows 7 updates at Microsoft aren’t all bad. Yet. This is good news so far; it hints that this “convenience rollup” update really might be worth using. However, I’ve only been monitoring it for a few hours after the installation. It needs to be running for some days (and especially overnight) before I can say with any confidence whether it’s staying quiet. I’ll let you know if I detect anything out of the ordinary. I tried a manually-initiated Windows Update. It took a few minutes, then failed with hex error. However, a notification pop-up came up shortly thereafter claiming an update was available. I think the error may have happened because it was checking on its own after I had started the Windows Update service, and my manually initiated check couldn’t start up a second instance. As mentioned above, KB971033 is an update from years ago that will actively check to see whether Microsoft wants to deactivate your license. I use only legitimately licensed software, but I can imagine any number of things could go wrong with that, so as a matter of course I always hide it on all my Win 7 systems. It was a bit of a surprise that only that update showed up as available. What I don’t know is whether they’re trying to tell me that KB971033 must go in before I can see any other updates, or whether there just aren’t any more right now that are not included in the convenience package. If this update is now required, that represents a change, as it has never been required before. ch100 2 years, 2 months ago. Noel, interesting observations and a more concise list of updates to keep an eye on with full explanations, while comparing to other much larger lists which are probably excessively long. I think your list is the one which should be used as reference for those concerned with the telemetry issues. – In relation to KB971033, what version on Windows 7 do you use for testing? I noticed that on Volume licence Pro and Enterprise, KB971033 comes as Important, but not ticked and has been like this for few years. In WSUS, KB971033 is not offered at all. I am interested to know if the Retail licence versions behave differently for this update, i.e if it is ticked by default. – I noticed that in your second list post-installing the Convenience Rollup, KB2952664 is missing. According to what I know, this update is not part of the Rollup, but your testing may prove something else. Was it just missed for being listed, was it installed behind the scenes or is just no longer offered? Now there is a very good reason why your previous settings have not been modified by the rollup and why no new telemetry was introduced. Those features have a lot to do with Microsoft understanding better the end-users systems to improve compatibility with the Windows 10 Upgrade via Windows Update. The Convenience Rollup instead has a different intended audience and is targeted to those IT Pros who have already decided to stay with Windows 7 for those systems where the Convenience Rollup is installed. I am convinced that the Microsoft developers fully understand the impact of their releases and there are no accidents when certain updates behave one way or the other. Those “accidents” are rather management decisions in one way or the other than anything else. Many thanks for this very useful work – much appreciated! What “uncommon software” do you use to monitor telemetry? stays “quiet” (I’ll look here once a day for new posts!). From there on, does KB3125574 include or not the Windows10 upgrade intruders or not? That is my concern. Short answer to your question: the rollup does NOT include 3035583 – the GWX installer – but it does include many other patches that are considered to be Win10 upgrade support. Several of those patches also install additional snooping routines – but exactly what they do is anybody’s guess. 2- The zdnet article you mention states the free Microsoft Assesment and Deployment Kit (ADK), an iso file which needs to be written on dvd and from there on installed on Windows 7. I have here the ADK iso file and though the process of building with it an operational so-called Win7 SP2 ready OS install seems a bit heavy/complicated (but feasible) I might opt for that. Noel, The reason you had a problem using Windows Update after installing the “SP2” rollup update is that it doesn’t include the updated “Windows Update Client” – which is a major element of the “Win7 Slow WU Fix”. I think Mary Jo has the right balance in naming the Convenience Rollup. The system made no overnight online contact attempts, as verified by Sphinx firewall. So far so good. I chose a VM snapshot that I had made a few months ago, which at the time I had used to reproduce the “CPU hard loop” problem with Windows Update. That system had ALL available updates, including optional, save for the ones I listed as hidden. >Windows 7 do you use for testing? Windows 7 x64 Ultimate, installed from a retail package in 2009, and maintained fairly carefully ever since. This system is tweaked and lean, settling to a process count in the 30s when left alone. Good catch. I need to re-check my lists carefully. I didn’t actually wait for a long update startup but dredged that list up out of a screen grab I’d made back when doing my prior Windows Update testing, and I was pretty sure it was from that system. However, I need to restore the snapshot, waiting the 30 minutes for Windows Update to finish a check, look at the hidden updates, and be sure. It’s worth getting this exactly right. Sure, easing the pain of setting up a new Win 7 system is important to folks who want to do new setups with an old OS – even if Microsoft can’t yet understand why you’d want to do so. But I also see it as pertinent if it might be able to bring people’s existing systems out of the “update hell” that many have been experiencing lately. If – as we hope – it’s not a “trick” to get more Windows 10 prep/nagware into peoples’ Windows 7 systems, it could be (as Woody has suggested) the equivalent of an “SP2” installation that helps folks maintain their systems moving forward more efficiently. We have entered a time, unfortunately, when parts of Microsoft have proven that we need to be VERY wary about anything they do. Remember when having an update like this show up would have been all positive? 1. I use the commercial Sphinx Windows 10 Firewall (Network/Cloud edition) on all my systems. It provides a very nice monitoring readout. At present I have a beta version as I have been working with the author on making it even more usable and robust. I have set up a deny-outgoing-connection-by-default configuration across the board, which is more work to manage than the default permissive setup in Windows, but is also more secure. 2. I run a local DNS server from which I can watch the logs in real time to see what name resolutions are done. That’s always VERY interesting to watch. So far, this Win 7 test setup has not attempted any unsanctioned online contacts in most of a day. Of course it still does do the normal, expected comms, such as contacting online certificate information servers, NCSI requests, anything ad hoc (like browsing), etc. Keep in mind I had already gone through the process of reconfiguration to avoid telemetry in all the ways I know, which included disabling a number of jobs in the Task Scheduler. My intent here is to see if anything gets undone or is added by this update, or if Microsoft stops following its own rules and attempts comms anyway. This needs to be clear: If you have not previously allowed the telemetry updates to be installed in your system and had not taken steps to thwart telemetry (basic opting out in the several places provided, disabling jobs), the convenience roll-up will add telemetry communications that you didn’t have before. This is quite interesting. Robert Smith PFE has useful recommendations which I am still assessing and I actually have reservations about some of those recommendations, in particular in relation to KB2775511. Otherwise it is very good information, based on the assumption that it is just an opinion and not absolute truth. Oh, and I agree with you totally, ch100 – Microsoft knows EXACTLY what they’re releasing in updates, and how the updates work. It’s just not something that could work by accident. I can confirm that ALL the hidden updates were just as listed in the original post. I had neglected to mention I had also hidden all the various language packs that were offered as updates at some point or another. I use only English. On another subject, something I noticed was that after the convenience update an SFC check was failing. I just re-verified that an SFC check passes before it’s installed. I’m going to do the install again and check SFC again after. Please keep us updated if we SHOULD install this update or NOT. SFC /SCANNOW passes before the convenience update and fails after. I’ve just verified it. If you are not applying this update to a fresh installation, make sure you can live without your PC for 40-70 minutes. If the update is unsuccessful, it will take the same amout of time to revert back the settings. Do a FULL SYSTEM PARTITION BACKUP before installing this. Interrupting the update may easily render your system into a non-bootable state. There’s no reason to install the “SP2” convenience rollup, unless you have a brand new Win7 installation. Many thanks for your prompt and thorough response to my post. addresses instead of hostnames to communicate with Microsoft servers? Thank you for all your replies Noel. One of them in particular seems to prove my belief that while KB971033 is offered to all Windows 7 editions as Important update, it is ticked by default for the retail versions (Ultimate is technically Enterprise less the licence which is different) and not ticked by default for the volume installations, activated or not (I tested in time with both). It can be installed though on the volume licence versions Pro and Enterprise from Windows Update. It is not offered at all on WSUS. Actually only two Windows 7 updates are offered on Windows Update and not on WSUS. They are KB971033 and KB3035583. Every other update is offered on both systems. In addition KB3035583 is not offered to Enterprise on Windows Update as it is documented in the KB article. New bug introduced by the Convenience Update in relation to SFC? I think there was an update introducing a similar bug which was corrected later. Might be the same bug which now appears as side-effect of one of the rollup’s components? Thanks for clarifying what your test system “fully patched” meant. It is indeed fully patched for the purpose of our discussion, as the omitted updates (those previously hidden) appear not to be part of the rollup. 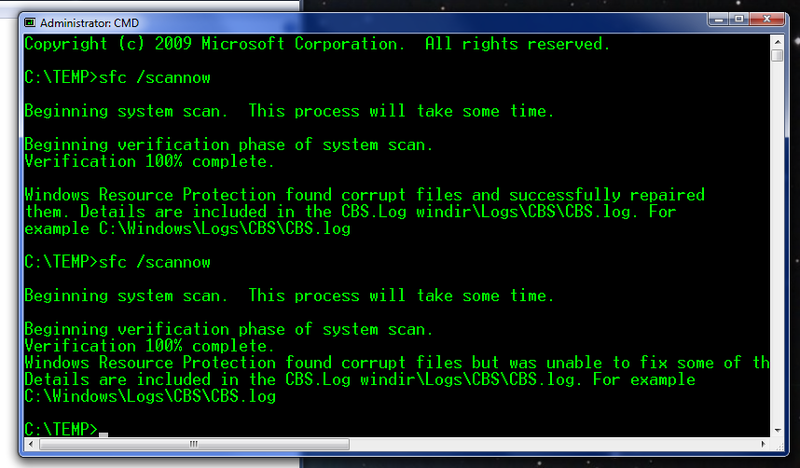 Just checked and my clean install with “SP2” and mine does NOT fail the “sfc /scannow” test. I was using a fresh Win7-SP1x64 install plus the “SP2” rollup update with all later MS updates installed via Windows Update. The CBS log shows the usual reams of Info messages about “Pending renames” and “Ignoring duplicate folder ownership” that you always get – but no Errors, Warnings or failed repairs. Noel, as I understand you say that the new rollup would enhance the already existing telemetry if it was allowed before the installation of the rollup, but would not undo what was disabled/blocked/not installed. If so, the typical installation of the rollup is with telemetry enabled as the recommended implementation is to apply it immediately after SP1 and the servicing stack update to create a new baseline, “SP2” like if we want to name it this way. In such a case, the measures to disable CEIP and additional components like Scheduled Tasks would be done AFTER the rollup installation. Note: I don’t like to designate the Convenience Rollup “SP2” because there is a clear delimitation between a Rollup Update (or Update Rollup) and a Service Pack in my view. The rollup contains previously released updates packaged in a convenient installer, while a Service Pack normally introduces new functionality, never released before (except for betas). It is true, but the Windows 10 Upgrade support patches by themselves do not trigger the upgrade invite without KB3035583 being installed on the system. The support patches introduce only additional monitoring of the local system by Microsoft, officially for the purpose of making the Windows 10 Upgrade more reliable. I don’t know and is hard to prove if there are other hidden intentions related to that monitoring and in theory this would be illegal without being clearly stated in EULA. However there are a lot of grey areas surrounding this subject. @Simpson There is a way to use DISM and slipstream the Convenience Rollup without using ADK. If you use virtual machines, you would be better off creating a VM template with sysprep for this purpose. If you use physical machines, a image of a sysprepped installation would also do the job. It may be a lot easier than to use the Microsoft ADK. Just be aware that KB3138612 is actually another one of those updates which facilitates the Windows 10 Upgrade in addition to the good effect on Windows Update behaviour from the previous versions superseded. As usual, things are not simple. I went ahead and allowed the pending updates to go in, because THIS time after installing the convenience rollup (KB3125574) quite a number of updates showed up. This is a very interesting difference because it’s the exact same virtual machine I had Installed the convenience rollup on before. I can only attribute the difference to a difference in availability of Microsoft’s online Windows Update services between the two times. Also, this time the update after the rollup install literally took hours. It finally completed at 2:35 am. I wish we could nail this whole Windows Update thing down again so that it didn’t require days of experimentation to try to figure out what’s going on. Several of those I had hidden showed up in the various lists, so I hid them again. Now, interestingly, the GWX update shows up TWICE in my hidden list. And none that were hidden before are installed now. And just now 5 more .NET Framework 4.6.1 security updates have appeared available for installation. They went in fairly quickly (a few minutes), without incident. Bottom line is that since I saw system protection broken on a system on which it would pass before (see the following), I can’t recommend the use of this update rollup. I note that at least one person has reported the rollup didn’t break their system protection. Your mileage may vary – mine often does. If the GWX update is KB3035583, then it is likely that you see multiple versions of the update released under the same number, but only loosely related. This was noticed by other posters too. It will likely be resolved next time when Microsoft does the cleanup for the older versions. It happens now and then with KB2952664, although right now I think only the latest version dated April 13 is offered and this one if it is installed removes the previous ones from the current list. I read Noel’s email and then checked my updates. I don’t see any of those numbers. Are they related to Ultimate only? I run Win 7 Home Premium SP1 (64bit). I did accidentally install 30355883 but had no unpleasant surprises from M/S (like the dang Windows 10 icon in the tray). Some months ago, when reading Windows Secrets, one of the writers described a registry entry that keeps that from happening. Apparently, it works! I apologize that I can’t tell you what it was. I would have to go through previous issues to find it. I eventually plan on installing Windows 10 but will wait until July 15 (after the “anniversary” edition) to do so. If I hate it, I can roll it back as others have outlined here and elsewhere. So, do I need to worry about the missing KB numbers? What about the supposed SP2? Thanks in advance for your input. For me an installation of Windows 7 Pro with all updates to date (May 2016) except those mentioned by Noel in the original post takes less than 2 minutes to check on Windows Update. This test machine does not have the Convenience Rollup and does not have other Microsoft products like Office, Silverlight, MSE. I do the check on Microsoft (not Windows) Update and it offers Silverlight and MSE, none of them being hidden. It may be that the additional products installed add to the scanning load, thinking primarily about Office. That’s likely true. 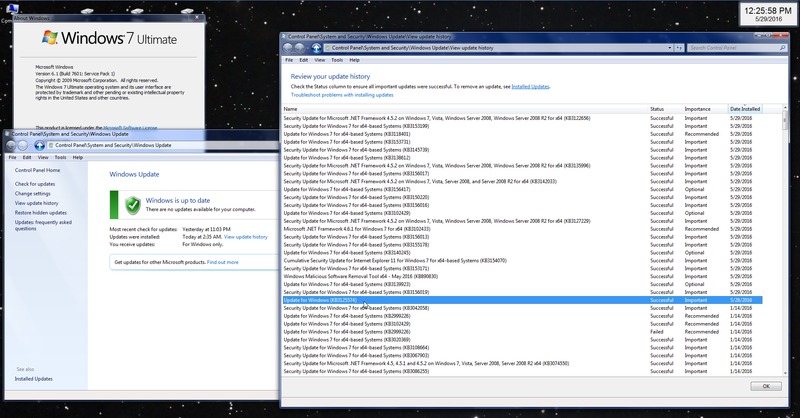 I simply took all the defaults – which includes WU auto update checked – when installing the rollup. Try Check for updates, leave over night and install groups of updates, let’s say start with all designated Update and Important. At next scan, continue with all Recommended Updates if you wish to install them, but if you are looking for efficient scans, you have to install the Recommended updates. Their role is to improve Windows functionality (with telemetry or not). The few updates related to Windows 10 in Noel Carboni’s recent list can be skipped without negative side effects. When all those designated Updates (Important + Recommended) are installed, continue with all Security. Only when all the core updates including Security are done (leave Optionals out for now and decide later if you want them or not), you can move on to IE. Leave .NET for the final round. If you will try the procedure outlined here, please let us know the results and how the scans perform after all is completed. Thanks for that info, Doug. It turns out I had the first two of those updates in my test VM, and the third one just went in with the latest Windows Update check. I’ve found that there can be a lot of “false positives” in checking to see whether the “long update time” problem is resolved. It seems to go away after this or that update, then comes back when there is a significant list up updates the next month. So we shall see whether things speed up in the future. I have a question regarding the monthly roll up process. Will MS be replacing the individual updates with the update roll up or will individual updates still be something you can filter out? I’m just hoping that Win Update doesn’t become a process whereby all monthly updates are rolled up into one package and thereby presenting significant risk. Further if you deploy SP2, but want to rip out specific pieces, if memory serves me correctly it’s an all or nothing proposition, unless you dig into the MSI/MSU packages. We don’t yet know. If it’s all non-security patches bundled together (as it is this month), just don’t check mark the bundle. Noel, would the Internet connection speed or latency make a significant difference in the performance of Windows Update? Or maybe using proxy servers or firewalls blocking certain not so obvious communication? I noticed that the scan through enterprise proxy servers tends to take longer than direct Internet communication and I have no way to find out exactly what happens when communicating through that proxy. It’s almost certain that the communications pathways could/would/will affect update speed, but when I watch Windows Update download data it’s actually quite sparse and VERY bursty. I have a fiber connection myself, with quite low latency to most online servers and whether Windows update has completed quickly seems to have more to do with what the software on the local system decides to check/do. I did further research about the updates proposed by Noel to be avoided. While the list is complete and accurate, I identified 2 updates in the list which are telemetry related, but not Windows 10 Upgrade related. Those 2 updates are also offered to Windows 2008 R2 Server which is used by businesses and not usually by individual end-users. They are indeed telemetry related and as such not desirable, but definitely not Windows 10 related. It is up to everyone to decide if they want those updates or not, knowing what they do. They may have a useful functional role which is difficult to assess and as such may be useful. I will wait for MS to sort it out! Just noticed a fix has been released for the SFC Integrity issue caused by KB3125574…. I was curious to know if anyone actually slipStreamed the rollup into a Win7ServicePack1.iso; I am currently in the process of finishing just that but was wondering if I should just scrap that idea. After reading most of the posts here I have realized that there have been some issues with the rollup. Please do let me know if anyone has had success with this process and if not what the errors were.